Laduree Patisserie has finally opened their first Australian store in Sydney this month. You can find it on the third floor of Westfield in Pitt Street Mall. Laduree created the double decker macaron in 1930 and are claimed to be 'The Best in the World', making 15,000 daily in Paris. The macarons are divine, their ganache flavours lean toward the more subtle and the cake is light with a crisp shell outer. With 18 flavours to choose, you can have a field day taste testing them all. There was one flavour I had never tasted, Strawberry Marshmallow. Incredibly light and spongy with a great strawberry flavour. My box of goodies were: Licorice, Strawberry and Marshmallow, Pistachio, Chocolate, Raspberry and Lemon. I had fun nibbling my way through them, slowly of course. At $3.20 each take away and $4 each to sit with tea. You would want to be careful who you share them with. As with anything, claims are always subjective and debatable, I'm not sure if Laduree claim to be the best or their customers have created a myth. I have tasted my fair share of macarons around Sydney and prefer the cake to be light and soft with a thin crisp egg shell layer on the outside. As for the ganache filling, I like unusual and authentic flavours, meaning the flavour should not taste synthetic and the ganache should be smooth and soft. 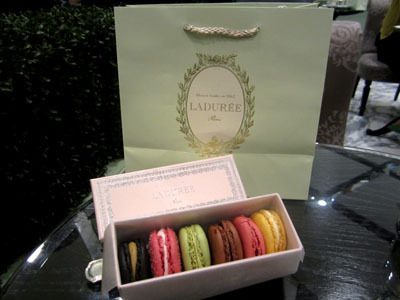 So my decision on Laduree macarons is: they are very good, yet I would not say 'The Best' I have personally tasted, again it is very subjective and personal. How do you like your macarons?